The end of an era is upon us. 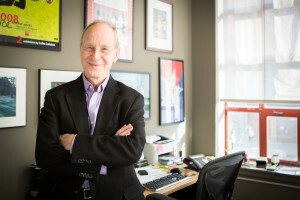 Since 1991, Stan Trecker has called the Art Institute of Boston his home; during that time, he served as President of AIB from 1991-1998, and Dean from 1998-2002 and again from 2007 to the present. And now, he is stepping down, preparing to retire. So, as the coming months mark the conclusion of another school year for some of us, they will also be marking the end of Stan Trecker’s impressive career. I was fortunate enough to catch up with Dean Trecker recently, and despite how busy he is, he took time to talk about his career and his life. For those who do not know him well, I hope this interview will shed some light on the impact he has had on our school and our community. Q: What are the moments of your career that you are most proud of? A: There are many. I am proud that I transformed my life from being a banker as a young man to being a photographer and an arts administrator working in the cultural sector of our society. This change has given me such joy and satisfaction along the way. I am proud that I led three amazing cultural and educational organizations that provided worthwhile programs and services to their respective audiences and employees. I feel especially proud to have worked alongside my colleagues at AIB to take it from the brink of closure in the early 1990s to strong growth in the late 90s, which led to the merger with Lesley University. I feel terrific about the result of the merger for both institutions and about the future prospects of the College of Art and Design with a whole new facility on the horizon, new academic programs to offer its students, and cultural events such as the Strauch-Mosse Visiting Artists series to inspire us all. I could go on. Q: Could you describe the role that you played in the moving of AIB over to Porter Square? A: I’ve been deeply involved in the project from the day I arrived back at Lesley and AIB in July, 2007 – so for nearly seven years. I started working with the Lesley team and the architects to contribute to the conceptual design of the building and then participate in scores of meetings with community groups in order to engage them in our goals. There were also hours upon hours spent with Lesley colleagues seeking the City of Cambridge approvals for the project and overcome legal challenges to it. A fascinating element was the more detailed work of helping to design each classroom, lab, gallery, and studio, down to the furnishings, lighting, ventilation and more. Currently, we are involved in weekly oversight meetings for the actual construction. And we are starting to plan the actual relocation of the College, which in itself is quite complex. Fortunately, the people I work with from President Moore on down were collaborators, visionary, and committed. We have architects who are careful listeners and sensitive to the needs of an art college and its students and faculty. We have a contractor whose team is similarly outstanding to work with. The list goes on and on. Now, it is a thrill to see the buildings going up! It has been a huge undertaking, but enormously gratifying and exciting. Q: Were there any monumental hurdles that had to be overcome? A: Yes indeed. Some I have indicated: design issues to satisfy community interests, legal challenges, and time pressures. It has also been a challenge to fund raise the needed monies to build the Lunder Arts Center and to stay within the prescribed budget. There will be more hurdles before the Center opens, I am sure. Q: Looking back on your career, is there a moment or decision you would like to have done differently? A: Oh sure, several. I’ve had to lay off personnel during tough financial times at each institution I have directed and some of those situations I could have handled very differently, with more care. As another example, I also created a new program and successfully sought funding for it, only to make a poor decision in how to implement it. I should have sought more advice before acting. I find most leaders and institutions face similar types of problems and that it is helpful to learn from their experiences. Q: How important was it in your career to surround yourself with the right people? A: It is absolutely key! You can’t do it all yourself. You have to rely on the people with whom you work. It is especially important to put in place effective, action-oriented people who have excellent people skills, especially leaders who can direct others in the organization. It also helps enormously if they love what they are doing, since the work requires dedication, commitment, and long hours. Fortunately, most people who want to work in an art college are self-selective because of their deep love of the arts. With all this, it is also essential to take great care with the process of hiring people. I have been fortunate to benefit from mentors and colleagues who taught me so much. Q: How has the culture of art and design changed for you during your time as dean? A: It has changed light years and is continuing to change very rapidly! The arts are so much more interdisciplinary than ever before. Artists are in a fundamental way beacons of change in society, they tend to lead the way by pushing through boundaries and barriers, by exposing mankind to things they have never seen, heard, or experienced before. Think of Christo’s wrapped buildings or gates in central park or umbrellas along the coast of California and Japan. Who would have thought? And now technology is impacting the arts profoundly. Nearly every form of art is impacted by the ability to create works of art and design through digital technologies, even if it is a simple as being able to see a three-dimensional image of the object you wish to create. Q: Do you see the move and the merger of AIB into Lesley as a good thing for the school? A: The merger has been, I feel, one of the real success stories for mergers in higher education. There were natural academic and administrative synergies to begin with, but there were also cultural differences to overcome with the two populations and environments. I firmly believe AIB/LUCAD has added to the strength of Lesley University (in fact, it was one of the primary additions that allowed the then-Lesley College to become a University). Similarly, I have no doubt that AIB/LUCAD is a much better institution as a result of being part of Lesley. Q: As dean, there are constant demands for your time; do you ever find it difficult to maintain a healthy work and life balance? A: Yes, it is a challenge and no doubt sometimes the work load and stress get away from me, and I experience health problems, such as colds, back pain, and worse. Fortunately, I have a number of outside interests that I really enjoy and my spouse loves culture and an active life as well. I also make a determined effort to get exercise 3 times a week. That and trying to step back and breathe helps a great deal. Q: What do you think you will miss most about being dean? A: The students for sure; they are a joy to be around and to watch grow as artists and people. And my colleagues at LUCAD and throughout Lesley – they are a pleasure to work with and help make any success possible. Finally, I will miss the daily contact with the classes and the artwork being made throughout LUCAD. Q: What words of advice would you give to your successor? A: Take time to focus on your vision and goals at the beginning. Start by listening and getting to know your colleague faculty and staff. It is a challenging time in higher education, especially for mid-sized, private colleges or universities like Lesley, so be patient, kind, and focused. Q: How do you see the next few years of your life unfolding? Any new projects on the horizon? A memoir perhaps? A: During the next two years, I am looking forward to continuing on at Lesley in the new role as Dean Emeritus. This will allow me to play a role in completing the Lunder Arts Center and relocating LUCAD to Lesley’s Porter Square campus. I’m also looking forward to devoting more time to creating collaborations with the other three Colleges at Lesley in terms of new combinations of academic programs. And to working with the neighborhoods and communities surrounding the University to allow them to take advantage of the new Arts Center. Finally, in regard to Lesley, I am excited about the potential for the significant variety of arts programs at Lesley to continue to grow and provide value for our students and recognition for the University and our alumni. On a personal note, my wife, Anne, and I love experiencing other cultures and peoples, especially in developing countries, and we are looking forward to spending concentrated time in such environments. I am also looking forward to getting back to my personal photography, which is the reason I got into arts education and arts management in the first place. So while I don’t have a memoir in mind, I certainly do plan on photography as a major part of my future.